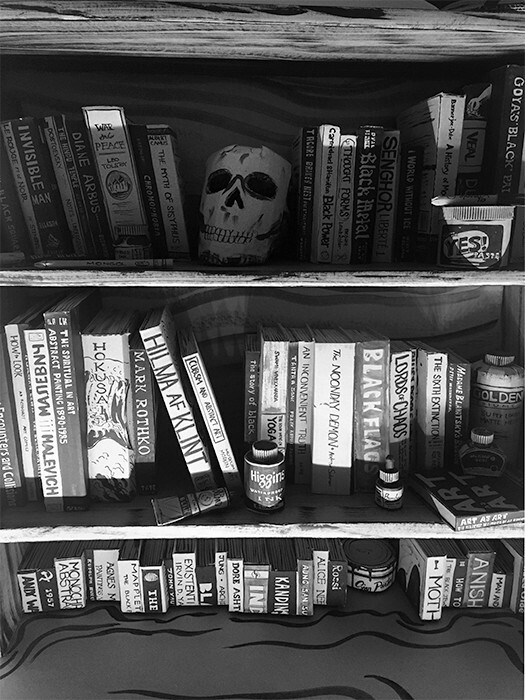 STUDIO FLOOD (Bookshelf Detail) 2017 Acrylic on cardboard, dimensions variable. Tom Burckhardt was born in New York City in 1964 and has spent his entire life living there. He graduated with a BFA in painting from SUNY Purchase in 1986 and attended the Skowhegan School of Painting and Sculpture that same year. He has been exhibiting since 1992 at various NYC galleries such as Tibor De Nagy Gallery, Daren Golden Fine Art, PIEROGI, and Gregory Lind Gallery, San Francisco, CA. His most recent show of paintings was at Tibor de Nagy in Spring 2015, and his cardboard installation FULL STOP has just completed touring the US for the last two years. He participated in the 2016 Kochi Muziris Bienalle in Kerala, India and that installation pieces, STUDIO FLOOD, was shown at PIEROGI Gallery, NYC in September 2017. He has been a resident faculty at Skowhegan in 2007 and currently teaches part time at SUNY Purchase.